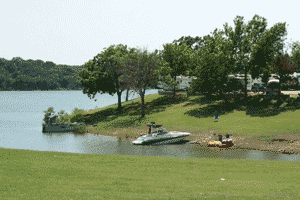 Little Glasses Marina Resort is one of the most pristine and beautiful getaways on Lake Texoma. Little Glasses is located on the northern end of Lake Texoma on the beautiful Little Glasses Bay. It is just a short hour and a half from Oklahoma City, Oklahoma or Dallas, Texas on Interstate 35. An excellent paved runway just minutes away. Our beautiful Little Glasses Bay is the finest water playground on the lake. So come on, grab the wake board, tube or skis, let’s get wet. Our beautiful shorelines allow you to just enjoy the day or you can find treasures from the past with our abundance of fossils. You can just take a walk and see our wild deer, turkey, or just might see a bobcat. We have some of the finest striper fishing to be found anywhere, right here, with excellent guide services. If you like catfish this is the place to put a hook in the water. You can rent one of our luxury pontoon boats and just cruise the lake with a BBQ or deli from our famous Margarita’s Deli. Enjoy your stay at Little Glasses and feel free to roam in one of our new golf carts. All golf carts are new Easy Gos with double seats for up to four passengers. Golf carts are rented on a daily or weekend rate. Must be 16 years of age with a valid drivers license to drive golf carts. Open Memorial Day weekend through Labor Day, Friday thru Sunday featuring Barefootn’ Bar-B-Que. They offer a variety of services such as catering, delivery, boat lunches etc. Call the store for details, 580.795.2068.